The meat of a perch, both marine and freshwater, rich in vitamins and minerals. It is well absorbed, saturating the body vysokovskoye proteins, fatty acids, and vitamin D. a Number of minerals, such as selenium, iodine, fluorine, calcium help you keep normal. A few of the recipes described here will help to diversify your diet. 200 ml of white wine. Fillet of perch in batter. Prepared fillet, i.e., defrosted, cleaned and dried, a little salt, sprinkle with mixture of peppers. With peppers it is not necessary to be zealous, and you will lose the taste of the perch. Will not prevent a few drops of lemon juice squeezed on the fillet. Leave the fish to marinate for 15 minutes and prepare the batter. For the batter you will need: two eggs, whipped in a blender, 2 tablespoons of flour, a little chopped or dried tarragon. To perch when feeding looked bright and delicious, add the battered peppers to the tip of a knife. Take a non-stick pan and break it oil that has no smell. Fillet of grouper dipped in batter and place on the pan, let fry for 2 minutes and flip to the other side. Place the fish on a plate, garnish with lemon and greens. 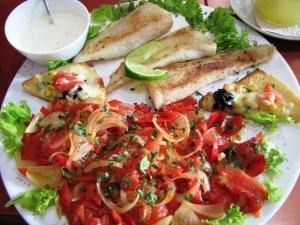 Fillet of perch with vegetables. Zucchini, tomatoes, bell peppers, carrots, green beans. Filet to prepare as in the first recipe. Cut crosswise into 3-5 pieces, marinate in dry white wine, after putting in sea salt and white pepper. Vegetables are washed, peeled carrots treated properly green beans and bell pepper. Cut into circles,1 cm wide, beans cut in half. Arrange on a baking sheet, drizzle with oil, preferably corn, it loses a minimum of nutrients during frying and has no odor. Put bake until soft in a preheated oven at 200 *C for 5 minutes. Take a frying pan or small baking pan with high sides, spread out like a fan of vegetables and fish, alternating between them. Pour the fish marinade and place in the oven at 210*C for 10 minutes. Fillet of seabass on a potato pillow. Fillet wash, dry. Lemon juice diluted with water in proportion of one to three, add a tablespoon of olive oil and a spoonful of Dijon mustard. Dipped in the mixture fillet. While the fish is marinating, peel the potatoes, boil it. Separately whisk the whites to a froth, in the whisking process, add salt to taste. When the potato is ready, mash it leaving no lumps, add the egg yolk. Cool, so it was not very hot. Puree, mix with beaten egg whites. From the resulting mass make any shape, it can be flat, round bread, or star shape. In a pan, sauté molded puree. This is the pillow for a fillet. Remove the fish from the marinade, dip the cloth, so that it is not dripping fluid. Heat a pan to grill and fry it fillet on both sides. Fillet ready to put on a potato pillow and garnish with thinly sliced cucumbers.